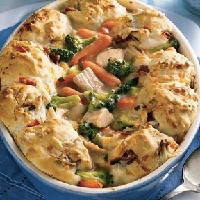 Instead of rolling out a crust, top a mouth-watering mixture of veggies and turkey with easy-to-make biscuits. Heat oven to 400 degrees F. In 2-quart saucepan, heat 1 cup water to boiling. Add carrots and broccoli; cook about 4 minutes or until carrots and broccoli are crisp-tender. Drain. Calories 360 (Calories from Fat 160); Total Fat 18g (Saturated Fat 8g, Trans Fat 1g); Cholesterol 75mg; Sodium 900mg; Total Carbohydrate 26g (Dietary Fiber 3g, Sugars 5g); Protein 23g. Daily Values: Vitamin A 170%; Vitamin C 25%; Calcium 15%; Iron 10%. Exchanges: 1 1/2 Starch; 0 Other Carbohydrate; 1 Vegetable; 2 1/2 Lean Meat; 2 Fat. Carbohydrate Choices: 2. This entry was posted on 9:15 PM and is filed under Turkey . You can follow any responses to this entry through the RSS 2.0 feed. You can leave a response, or trackback from your own site.